Whether you’re drawn to Bali by the legendary beaches and world-class surfing conditions, or by the misty jungles and sparkling highland lakes, it won’t let you down. The Indonesian island encapsulates a tropical world, blessed with cultural riches, spiritual celebrations, and rare wildlife. And of course you can also party the night away in some of the coolest clubs in Asia. 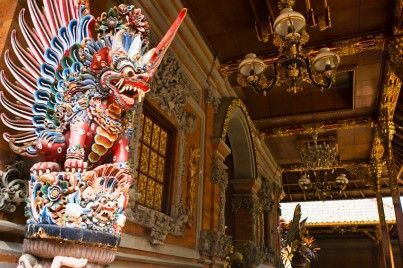 Alive with monster mega-clubs as well as chilled-out bars and cultural hotspots, Bali's got plenty going on to keep night owls busy on their holiday. There’s a kind of dizzying alchemy to the combination of fabulous sunsets, exotic scenery and party atmosphere which makes a night out in Bali unforgettable. It may be seen as the traditional preserve of backpackers and party-ready students, but Bali offers plenty for families in search of a memorable vacation. As well as activity parks set up to cater to children, there are enchanting animal sanctuaries and forest adventures which are ideal for families. Much like the many layers of its distinctive rice terraces, Bali is multifaceted and complex. Ancient temples, half-hidden in the rainforest, exist alongside modern beaches, with all the trappings tourists desire. Old handicrafts, passed down through generations, are still sold in traditional markets, while shopping malls sell sleek designer wares. In Bali, there’s always a surprise around the corner. With such rich diversity in its surroundings, Bali’s accommodation is as varied as the island geography itself. From family-run guesthouses to luxurious beach resorts, thatched-roof bungalows to private villas, there are plenty of options to select from to suit every type of traveler and budget. Saunter along the sun-speckled beach of Jimbaran Bay, delve into the wild forests of Ubud, or, soak up tranquil luxuries of Sanur and Seminyak. Just like all other Southeast Asian destinations, when it comes to shopping in Bali, bargaining is expected. Lively market stalls thrive on the daily chaos of trading and negotiation. Offering a spot of respite from the searing heat and hectic hawker scene, shopping malls sell brand name clothes and cosmetics to satisfy the expanding western market. Light, fragrant and infused with a gentle mix of local spices, eating in Bali is a cultural experience. A fraction of the price compared to western food, small rice-based and seafood dishes are affordable staples found in abundance. Authentic Balinese food is a little harder to come by, however, with most local eateries and warungs (cafes) serving Chinese, Indonesian or Halal cuisine from Sumatra. An exotic province brimming with island attractions, there is no shortage of things to see and do in Bali. Whether you choose to trek through the Balinese rice terraces, climb the rocky façade of Mount Batur, surf the waves of Kuta or scuba-dive the coastal reefs, you won’t be short of activities to keep you busy. A tiny Indonesian province, Bali’s geography is etched with verdant rice terraces, dewy jungle palms and rippling sandy bays. Becoming increasingly popular as an island getaway, Bali has plenty of attractions to tempt travelers. Head south to Uluwatu Temple to witness hypnotic displays of the kercak dance, visit Ubud to explore local villages filled with ancient handcrafted techniques, or journey east to plunge into the picturesque dive spots dotted all along the coastline.